Every year Mexico's traditions police take to social media to berate those who celebrate foreign holidays, especially if that tradition comes from the United States. It happens at Halloween, and it happens at Thanksgiving. How dare anybody south of the Río Bravo — they cry — dine on roast turkey with cranberry sauce and mashed potatoes on the last Thursday of November. Even so, ever more people in Mexico are embracing the celebration, and adding their particular flavor to it. The most obvious reason for the meal's increasing popularity is the high number of Americans living here, but there are also growing numbers of Mexicans who have spent years in the US but are now returning home. Then there are those who simply got seduced by the recipes they found online. As the United States absorbs Mexican culinary traditions — from tacos to guacamole — and avocados even have a float in Macy's parade, I wanted to explore how Thanksgiving is being celebrated in Mexico. Here's what I found. Sometimes we forget that Mexico is a country of immigrants. The granddaughter of an Armenian who migrated Mexico via Beverly Hills tells me that her Thanksgiving menu includes Lebanese and Armenian dishes, as well as turkey and cranberries. My college friend Jessica Dietzel tells me that, since her dad is from Buffalo, the family has always celebrated the holiday, but it is easier today than it used to be. "When I was growing up we drove to Texas to get the ingredients for the dinner. 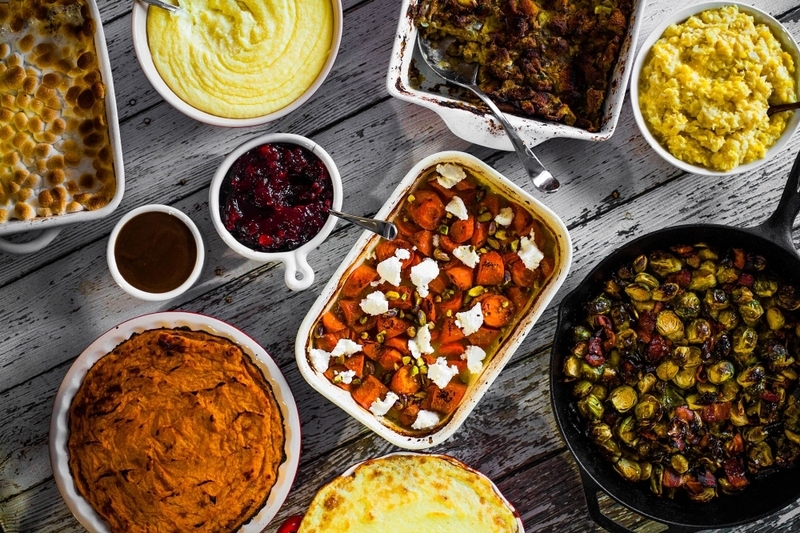 From the turkey to the cans of cranberry and the pumpkin mash, everything!" she says. "Now it's much easier to find it all here." There are some, like chef Justin Ermini of Anatol Kitchen, who get a bit more fancy. He prepares precooked New England turducken — deboned chicken and duck inside deboned turkey — for those who want to celebrate Thanksgiving with something special, but don't want to do the work. "The idea is that when it is cut, you are able to see multiple layers, like a lasagna," he tells me. Alexander Suástegui — a chef from Lucas Local — says she's always celebrated Thanksgiving because she grew up in the border cities of Ciudad Juarez and Tijuana. "As people living on the border we are more flexible with the cultural issue. Going to San Diego to celebrate Thanksgiving at the home of friends or uncles is very common, because aside from eating you spend time with your loved ones," she says. "The date is important to me because it reflects union and gratitude. It's one of the celebrations that makes most sense to me, although it does not have Mexican roots and I do." Then there are those who prepare Thanksgiving meals just because they can, and just because they want to. Helmuth Rueckert may one day become the first Mexican arrested by the traditions police. He celebrates Thanksgiving, he admits, because of the bombardment of US culture — as well as a particular interest in cranberry sauce. "It's a very sad story," he says, "but, since I live in Monterrey and you can find fresh cranberries here, I prepare a Thanksgiving-style meal." But Thanksgiving in Mexico is far from just imitation. Jessica — my friend who used to travel to Texas to get ingredients — tells me that her family turkey recipe comes from her American grandmother. But the traditional bird now also shares the table with marinated roast pork and other Mexican dishes. And, she adds, "We never forget the tortillas and the hot sauce." Chef Ermini also turns to Mexican ingredients to add a little extra something to his turducken. "Why use frozen ingredients if there are amazing and fresh products here?" he says. He likes to use green sausage from Toluca in his stuffing. And, since he couldn't find fresh cranberries, he uses kumquats as a side dish. "Our sous chef has a tree in his garden, so we modified the recipe to use them instead of the cranberries. We get an amazing flavor". In her restaurant kitchen Suástegui too has taken to adapting her Thanksgiving recipes for the Mexican palate. "I add a stuffed chili pepper and a good salad of green beans, and prepare roasted white corn instead of using the boiled yellow one," she says. Josefina Santacruz says that when she was a chef at Dumas Gourmet she went further. "I made turkey but with mole Xico-style," she tells me. "I added piloncillo to the mashed sweet potatoes instead of brown sugar and a twist of chile de árbol. Sometimes we also offered jamaica sauce, instead of cranberry sauce." Across the country in the resort city of Cancún, Mexican-American artist Ana Victoria Calderón says her Thanksgiving now involves 40 people from four families from both sides of the border. Over the years, she says, tradition has come to dictate an appetizer of scallops. Meawhile her aunt, she adds, cooks turkey in a traditional way — except she makes the stuffing with tamale dough. Whether it stems from national identity, inherited habit, or from a simple desire to eat something delicious, the Thanksgiving celebration is gaining ground in Mexico. And why not? Instead of raising a disdainful eyebrow, perhaps these difficult times create all the more need for a night devoted to family, friends, food, and a chance to give thanks for it all. This story was originally published at Munchies En Español.